Or least some of us can. Alkaline hydrolysis—also known as liquid cremation or water cremation or bio-cremation—is currently legal in only 8 U.S. states. Despite being one of the cheapest and most environmentally-friendly forms of dealing with a cadaver, it is not an option for most of us. 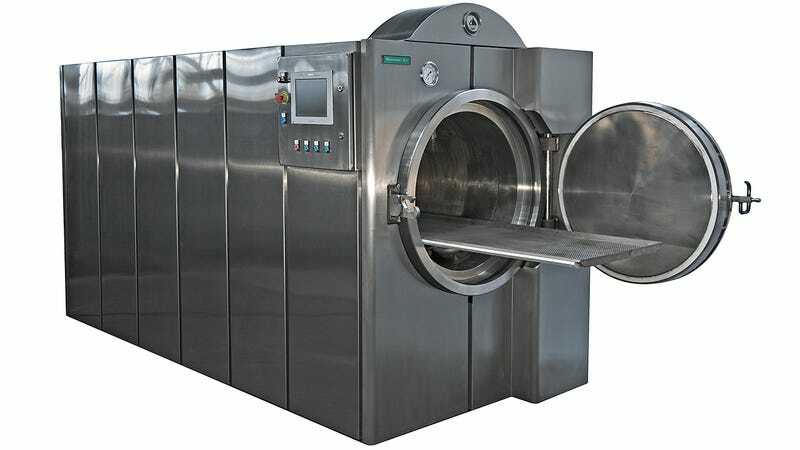 One way to think about it is that alkaline hydrolysis rapidly speeds up the ordinary decay process using heat, pressure, and an alkaline substance such as potassium hydroxide or sodium hydroxide. The body is put inside a steel vessel with 80 gallons or so of water that is heated up to 300 degrees—killing any microbes and even destroying prions responsible for the human version of mad cow disease. After an hour or two, most of the body dissolved into liquid. The remaining bone is ground up into ash. “I think there’s a lot people who just don’t understand the process,” says Terry Regnier, Director of Anatomical Services at Mayo Clinic, which successfully got Minnesota to become the first state to legalize the process in 2003. The clinic now uses the process on all bodies donated for research and teaching. The process is currently legal in Colorado, Florida, Illinois, Kansas, Maine, Maryland, Minnesota, and Oregon. A few years ago, when Edwards Funeral Service in Ohio bought an alkaline hydrolysis machine, they were ordered to stop amidst some controversy. Catholic clergy, for instance, said it wasn’t “ showing respect for that body.” It certainly doesn’t help that the process was first developed to dispose of dead animals.